Our mind-made stories are so often driven by fear instead of faith in ourselves. 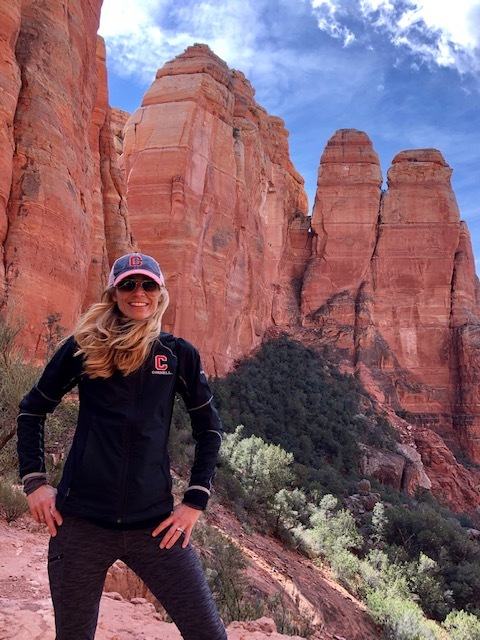 Miley’s lyrics were on repeat in my head as we began our ascent of Cathedral Rock, one of major energy vortexes in Sedona, Arizona, known for generating inspiration, serenity, and greater oneness. My group of college friends had gathered from far and wide to celebrate a half a century of life in this beautiful place known for its red rock and spiritual energy and a small group decided to embark on this challenging hike, which according to local guides, was not for the faint of heart. Let me set the record straight by saying I am not, nor have I ever been a hiker. I am a former Division 1 athlete and psychologist who still loves a challenging work out, but who does not enjoy walking and is deathly afraid of heights. However, my interest and intrigue around everything spiritual won out and I quickly jumped in the car heading to Cathedral Rock. I was not missing out on this quest for “calm” and the life changing transformation that Wilkepedia had promised. The five of us started out traversing rather casually across the mountain of rock. The initial incline was so gradual, I barely noticed how high we were climbing. As the incline graduated to more vertical, rock-climbing passes, I began to get winded. I knew I was in trouble when we began a challenging vertical climb between two flat smooth humungous rocks which met in a narrowly shaped V. As my borrowed, flat-bottomed Adidas walking shoes struggled to find a secure perch, I made the mistake of lifting my head and looking left. Immediately, the onslaught of doubt, negativity, and fear invaded my brain. My mind began churning out stories that told me I wouldn’t be able to make it back down, stories that made me lose trust and confidence in myself, stories that made me want to quit right there. My mind became fertile ground for panic and fear. In that moment it dawned on me, I could quit or I could know what it feels like to look straight into the eyes of fear and anxiety and find my own calm. Luckily, my mindfulness practice kicked in. I stopped looking left and brought my head back to the trail in front of me while taking a long, deep breath. I focused on my breath and where I would place my foot next. One step at a time, I began to breathe deeply allowing my heart to resume a more natural rhythm. My friends provided calm words of encouragement while I resisted the temptation to look left and kept myself focused on the trail in front of me. This absolute presence kept the negative voices at bay and allowed me to continue forward. When we made it to the first plateau, I rested. I couldn’t enjoy the view just yet. I continued using my breath and my focus and with each step, I felt my confidence building. Upon reaching the summit, which consisted of a narrow ridge, I felt a surge of energy. We took in the magnificent views, we witnessed and cheered for a couple getting engaged and just as the fear began creeping back in at the thought of descending, we met a young man with two prosthetic legs and an amputated arm who had just made the climb with his two friends. I was re-energized and inspired by his positive attitude and determination. Our encounter with this young man and his two friends, sparked such a feeling of gratitude for simply having healthy, strong limbs and helped me regain trust and confidence that I would make it down safely. Our descent felt easy, which was a good reminder that we are often responsible for creating our own fear and anxiety. Our mind-made stories are so often driven by fear instead of faith in ourselves. In our unending “chase” for calm we tend to look outside ourselves, when everything we really need lies within us if we trust enough to find it. Stay present, build supporting teams around you, embrace challenge, take time to rest, practice gratitude, trust yourself, lead with love, and when things get tough, keep your head down and take one small step at a time because the calm does not come from the rock alone, but from the climb and the people we meet along the way. Lauren Gallagher, Ph.D., is a school psychologist, author, public speaker, and mama to two teenagers. She is the co-founder of Sync It Up Sports, where she consults and develops mental fitness curriculum for youth sports. Lauren recently co-authored her first children's book, The Hard Hat for Kids, with Jon Gordon - a story about being a great teammate. She has a private practice where she works with young people to help them discover their unique passion and purpose so they can lead their very best life.